We’d love your help. 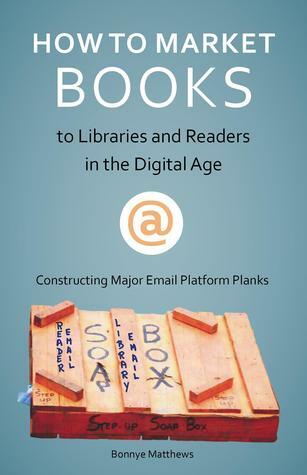 Let us know what’s wrong with this preview of How to Market Books to Libraries and Readers in the Digital Age; Constructing Major Email Platform Planks by Bonnye Matthews. To ask other readers questions about How to Market Books to Libraries and Readers in the Digital Age; Constructing Major Email Platform Planks, please sign up. How do you approach a librarian about your book? This was a great quick read on the importance of marketing your product. Specifically, it was focused on being an author approaching public libraries to promote the books you have written. This is a book that anyone can read even if you are not an author. It gives great tips on reaching potential clients to tell them about your brand and what you have to offer. I highly recommend this to anyone who would like to know more about marketing or is looking for a few new tips in reaching out to others This was a great quick read on the importance of marketing your product. Specifically, it was focused on being an author approaching public libraries to promote the books you have written. This is a book that anyone can read even if you are not an author. It gives great tips on reaching potential clients to tell them about your brand and what you have to offer. I highly recommend this to anyone who would like to know more about marketing or is looking for a few new tips in reaching out to others thru networking. Yearn to wrap yourself in a colorful fabric woven from geology, anthropology, anthropology, archaeology, paleontology, climatology, and pollen studies into great, memorable stories that leave you wanting more? Curious about your ancestry roots way back in time? Way, way back in time? Searching for something refreshing and enlightening? ֍ Yearn to wrap yourself in a colorful fabric woven from geology, anthropology, anthropology, archaeology, paleontology, climatology, and pollen studies into great, memorable stories that leave you wanting more? ֍ Curious about your ancestry roots way back in time? Way, way back in time? ֍ Searching for something refreshing and enlightening? ֍ Crave escape to a place where peace among people just might be possible? ֍ Hungry for something to feed your thought while firing your imagination? ֍ Want it premium, based on the very best evidence science has to offer? Let me introduce you to your ancestors. Without them we wouldn’t have learned to settle down to plant and raise animals, build civilizations, become industrialized, or use the net. After five years of intense, non-stop research into the peopling of the Americas before the Ice Age, I discovered that much of academia's theories on the peopling of the Americas were more fiction than science. This opened the door for me to blend my two passions: (1) truth as closely as we can approximate it with what we know scientifically of prehistoric people and (2) my talent as a writer. I now know Neanderthals, Homo erectus, and Denisovans. That time spent with them blended for me truth and talent, enabling me to write award-winning fiction that's more accurate than the old science. You can test my research, my writing, and discover your way, way back in time ancestry by taking a peek into my works http://amzn.to/2kV68d3. Look inside Ki'ti's Story, 75,000 BC (first novel in the Winds of Change series on the peopling of the Americas before the Ice Age) or Freedom, 250,000 BC (first novella in the archaeological sites series) and enjoy the read!